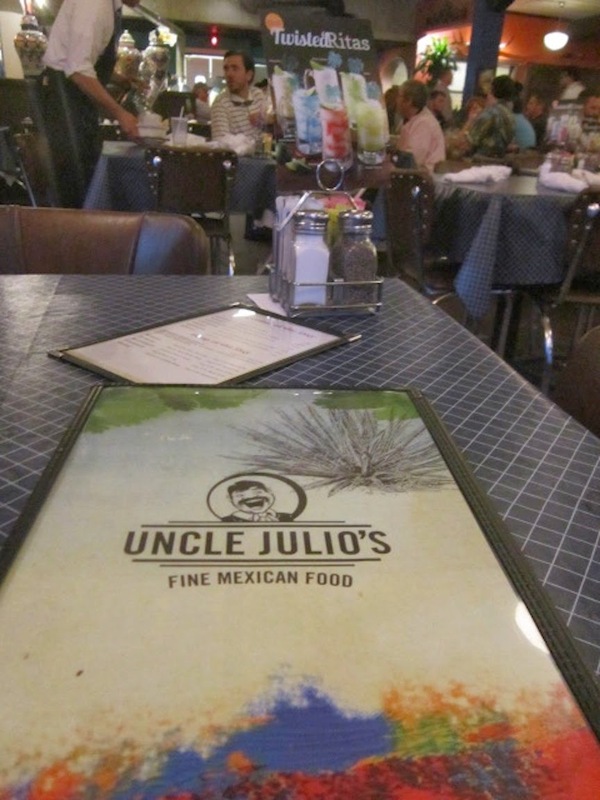 I wish I was more excited to blog about Uncle Julio's but I have to say the lack of enthusiasm is not because of the food, drink or atmosphere but because it is our "cheer us up" place. It has been the place we go after hard luck runs and this time it was the same. The restaurant was packed and very lively! I like walking into a place with activity. That instantly is a mood lifter! To hear people laughing and see them smiling rubs off on you. 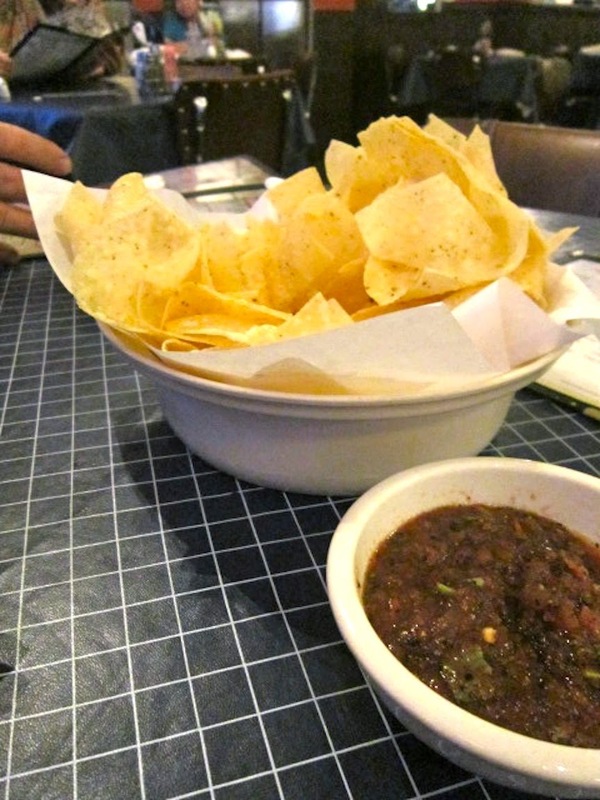 As soon as we sat down we were greeted with a hot basket of chips and their delicious smoky salsa. I love that the chips are thin and crispy. The salsa tastes fantastic. I should buy some to-go and enjoy the same wonderful heat with chips at our hotel for late night snacks. 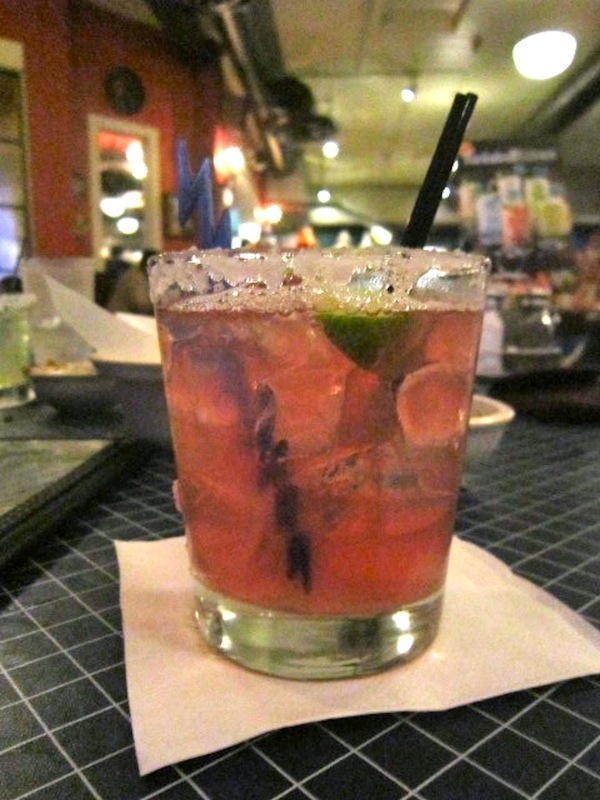 We splurged with margaritas and I chose Como Rita - Patron Silver, sweet and sour and cranberry juice. It was lovely. Not too strong and had an excellent flavor. I was in the mood for protein so I ordered the Honey Chipotle Salmon. It was perfectly cooked and the sauce not to spicy or sweet. As I ate each bite of salmon, I also forked in the rice that was laced with black beans, cilantro and corn. It really is a wonderful option when you do not want "heavy" Mexican food. Scott also was craving protein but went the beef route and had the combination platter. 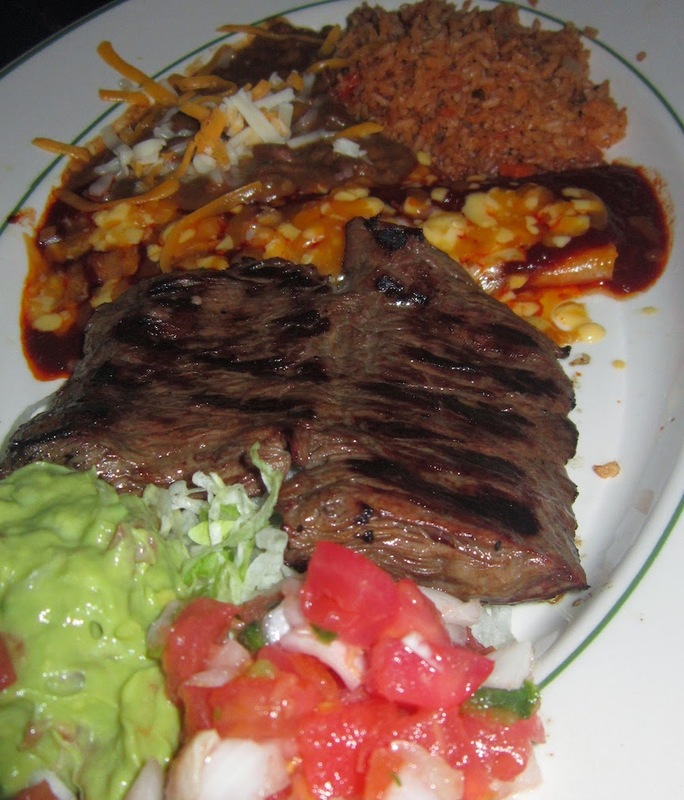 Six ounces of carne asada, a cheese enchilada served with rice and beans. I have to say looking at this photo right now is making me crave Mexican food! Anything makes me crave Mexican food, so I am sure I am going to have to convince Scott to go here again. It is a commercial joint so don't go expecting totally authentic but it is very good. The servers aim to please, the food comes out hot and drinks cold. What more can you ask for? 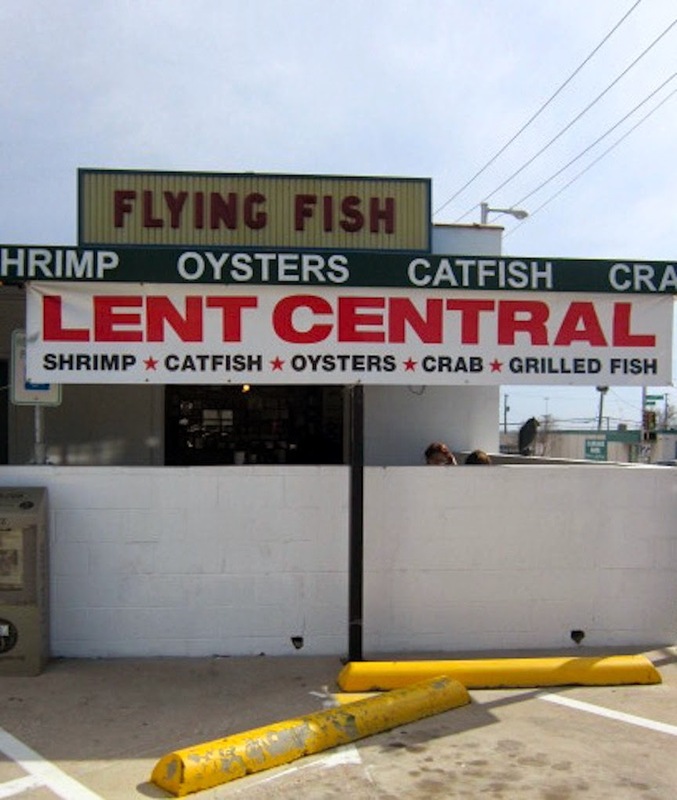 Whenever we make the trip to Texas we eat here at least 4 or 5 times. It is located just down from the Will Rogers Coliseum where the NCHA Super Stakes is held. Cowboy Ron loves this place but he is not due in for a couple days. I couldn't wait any longer for my first visit so Scott and I went in together for a late lunch, early dinner. Scott went with his usual stand-by the Tilapia Tacos "Make It Snappy" which also means "spicy". He loves them so much that I think that is all he orders here. He also thinks the beans and rice served together is just the bomb. I was a complete glutton and went for a basket of grease. 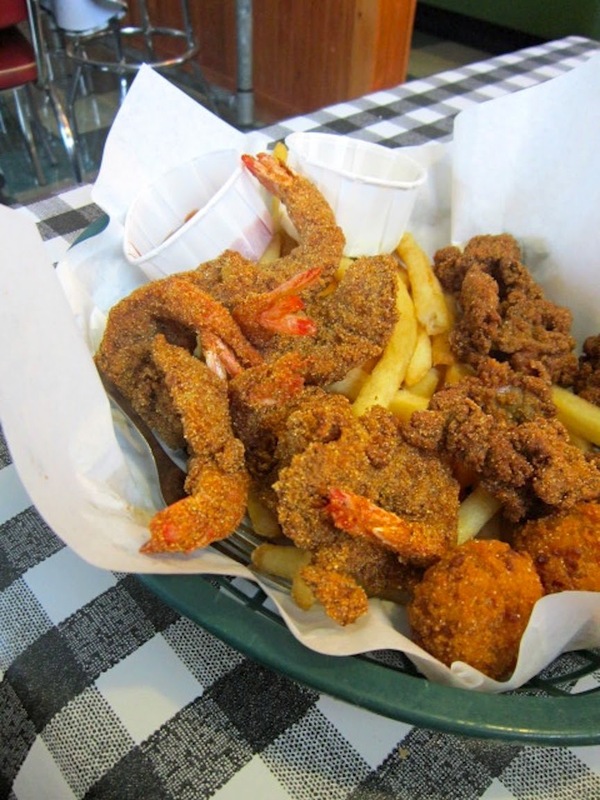 Deep fried oysters, shrimp, fries and two hush puppies all washed down with tartar sauce and ketchup. I ate the whole thing and actually felt a little guilty and a smidge nauseous as we walked out to the truck. As I counted the calories in my head I also remembered all the work I busted out all morning and afternoon without stopping to have a decent meal or snack before this. I don't recommend skipping meals and then ingest your entire caloric intake in one sitting but sometimes in this business you don't have much choice. As I write this it is 8:11 P.M. Texas time and Scott is fast asleep and I am not too far behind. Good night all, eat well... I will do better tomorrow! 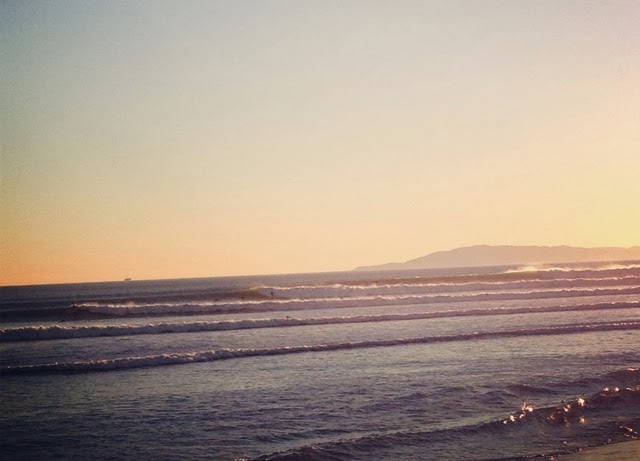 Scott usually goes surfing by himself these days. When he loads up his surf truck I find myself running my own errands or meeting up with one of my hilarious friends. I told him to hang ten and sent him on his way to catch some waves in the big blue. I buzzed around town, had a short visit with my buddy Lindsay and then surprised him at his favorite beach just as he got out of the water. He was thrilled and we decided to have an impromptu date night to celebrate. 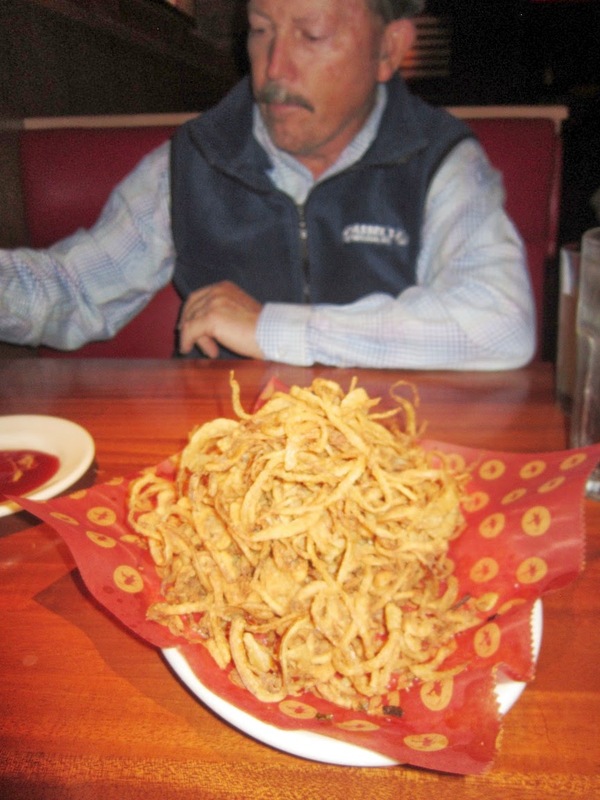 The hostess grabbed us and we ordered Onion Rings right away. They are fantastic and even more so dipped in their BBQ sauce. At a BBQ place I should have been craving ribs but I truly was in the mood for a salad. But not just any salad, but Natalie's Salad with baby greens, avocado, candied pecans, gorgonzola, cucumbers and a supplemental Salmon filet. It was terrific, light but totally satisfying after all those onion rings. Scott was in the mood for manly food after burning calories during his late afternoon surf session. He wanted tri-tip, corn on the cob and I wanted suggested pulled pork with macaroni and cheese. We ordered it all with the piece of mind knowing we would just take home what we didn't finish. The tri-tip was a bust, it took a lot to saw and chew through - the dogs enjoyed it. The pulled pork was solid, the best on the plate. The corn on the cob was a smidge soggy, but he did appreciate the char on the kernels. And macaroni and cheese, not as goo as Melissa Good Taste's version but that is a tough battle to win! Some of the best times are the ones that are unplanned. When you roll off the seat of your pants and live in the moment you create the best kind of memories. Keep your relationships fresh, fun and easy my friends! Most of my days while home in Ojai require a lot of errand running. We work horses in the morning and then I set for down the hill and check out places I have never been. I know you must think it is not possible living in such a small community but it is true! 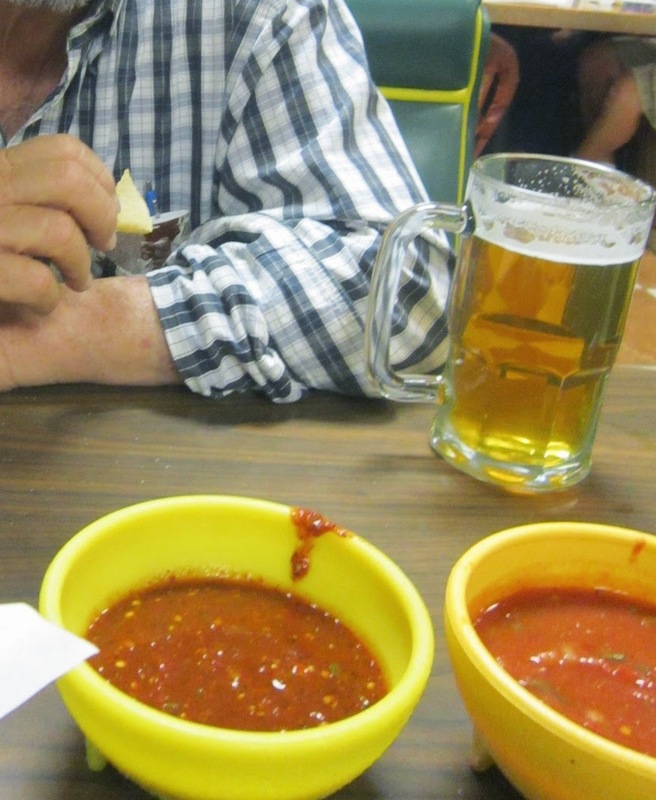 The small town of Meiners Oaks, which is just a hop, jump and a skip from Downtown Ojai, is a convenience store by the name of La Flor de Michoacan. Sodas, alcohol, chips and candy line the shelves along with a full Mexican kitchen busting out great, traditional food from their home country. I ordered a trio of tacos with meats of carne asada, carnitas and al pastor with everything. They were all outstanding. I dressed them with Valencia hot sauce and washed it down with a Coca-Cola. The meal was extremely affordable and totally hit the spot. If your a local and have not tried it, you are missing out. 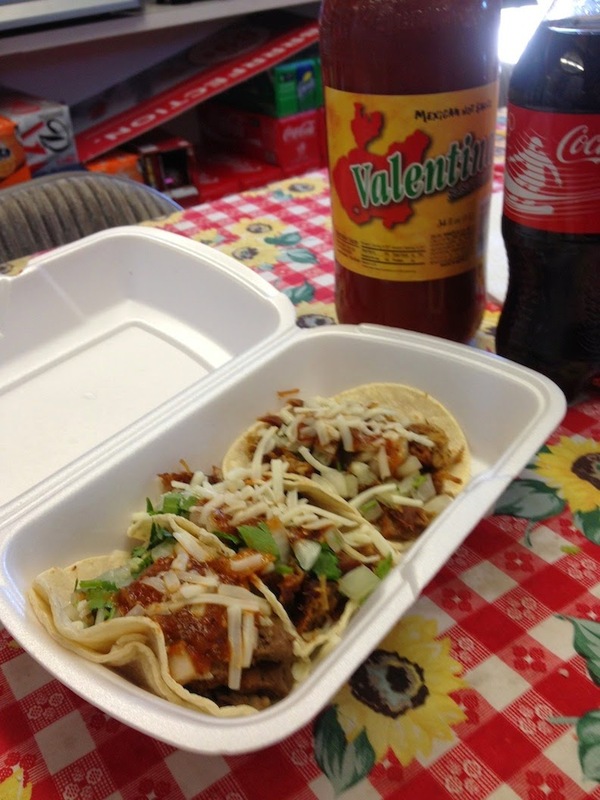 Go and get authentic Mexican food today! By living in a cute little resort town we have the options on where we want to dine. 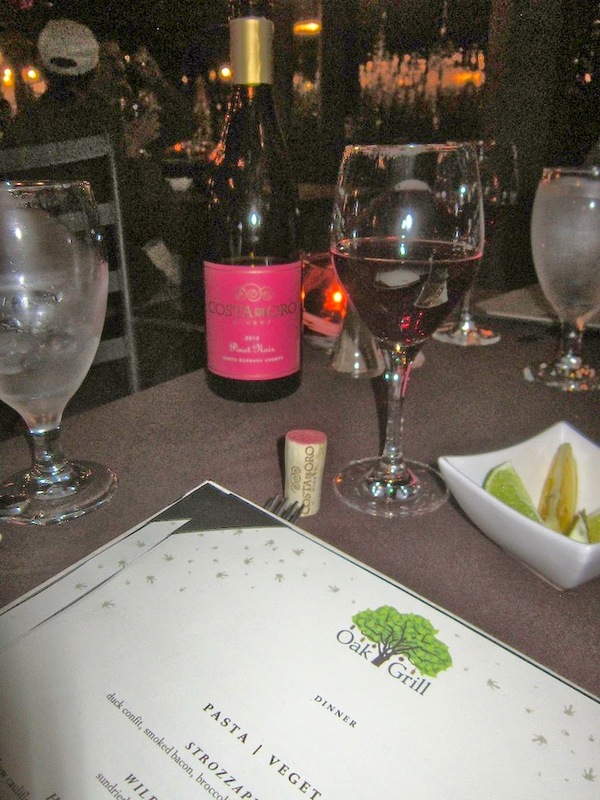 Two extremely nice options are found at the Ojai Valley Inn and Spa so we took our pal Cowboy Ron in to the Oak Grill to enjoy an evening on the patio. All three of us were in the mood for Pinot Noir so I was the boss and gave it the ok.
All three of us all wanted to start with something before our main courses came. I of course went for the Chicken Tortilla Soup it was perfectly tasty and filled my body with a bowl of warmth. It was a chilly evening and soup to me is like a pair of fuzzy socks. Scott is gaga for corn like I am for soup so when he saw the Grilled Corn Salad on the menu he dove head first. Avocado, arugula, grilled peaches, pickled onions with a tarragon vinaigrette rounded out the plate. it should have been delicious, Scott should have loved every bite. Sadly it was lack luster, maybe because corn is out of season, i told him hang on until summer. Cowboy Ron always orders a Caesar Salad and it makes me smile every time because he gets extra anchovies. I love anchovies so much. I sometimes forget it too. They would make an excellent snack in Melissa Good Taste down time. I was craving a big piece of well cooked fish and when I saw Scottish Salmon paired with ricotta gnocchi it made my heart swoon. The crispy, seared salmon was perfectly prepared and went nicely with the cauliflower and roasted tomatoes served. This is a most order. My two cowboys both ordered the Wild mushroom Ravioli bathed on a sun dried tomato sauce and onion compote. They both thought it was delicious and licked their bowls clean. We all had wine left in our glasses so we decided a rich chocolate dessert would help us finish it up. 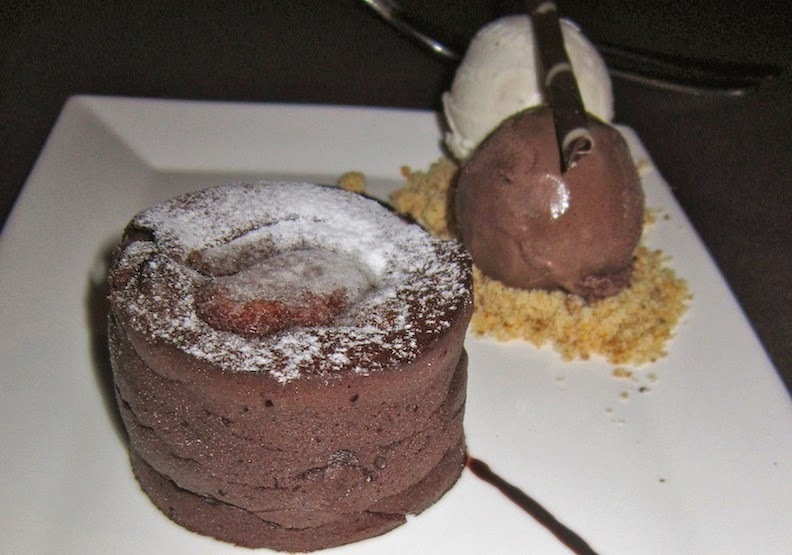 The chocolate cake served with ice cream did the trick. It took a little too long for the dessert to hit our table so we were less excited about it as it finally hit our table. Other than the dessert taking a little too long, the meal itself was a hit. We are beyond blessed to have such a luxurious meal with people we love. As I sit here at the computer writing this post I am procrastinating on packing my clothes for our next horse show. We will be in Fort Worth, Texas for the next few weeks and it made me realize how much I am going to miss this little lady, meet Dana Doyle - owner of Queen of Tarts Catering. She and I meet once a week, usually on Monday's, to catch up on food, fashion and all things fabulous! 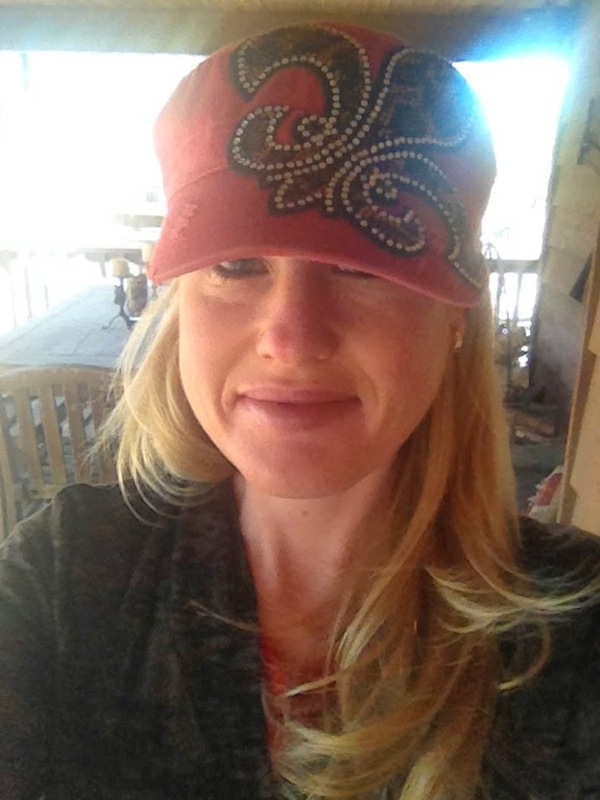 She and I both flip for Lure Fish House so as we both had errands to run in Ventura we met up there. The location on California Street is easy access, the only bummer being you pay for parking on the street. She and I split a half dozen Oysters and had a ball dressing them up with too much horseradish and lemon. Good oysters make me feel like absolute royalty. Their New England Clam Chowder is pretty solid. It is not the best that I have ever had but it does cure a craving. 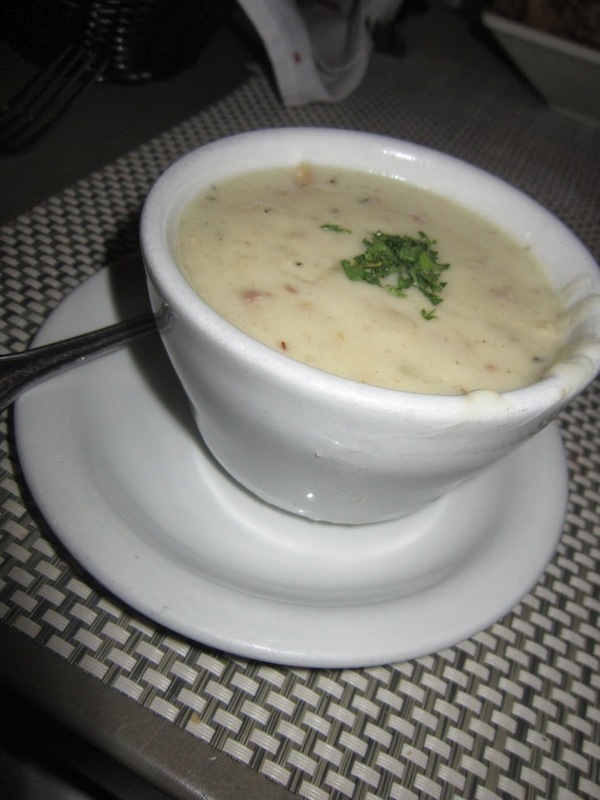 It is not filled with potatoes or thickened with gobs of flour so it is something I can proudly recommend when feeling the urge to get your chowder on. I went big at this lunch and ordered Crab Cakes to wolf down with my meal. The cakes are great and spicy aioli served on top is solid. Truly though, the main reason I love this is because of the tasty corn slaw served underneath. 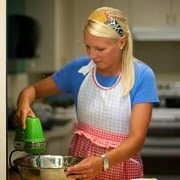 The ingredients remind me of summer and I cannot wait for fun parties held on our wrap around porch in months to come. I look forward to more "Ladies Who Lunch" posts with my gals from the 805 but in the meantime I get to meet up with my old, fabulous roommates from my college days in Fort Worth. I am beyond lucky to have so many fine gals in my life to lunch with! The last day Cowboy Ron was in town we celebrated with his friends on his job well done. He was the Non-Pro 7&Up Reserve Champion and was the 200,000 Limited Champion on his horse Scamper. 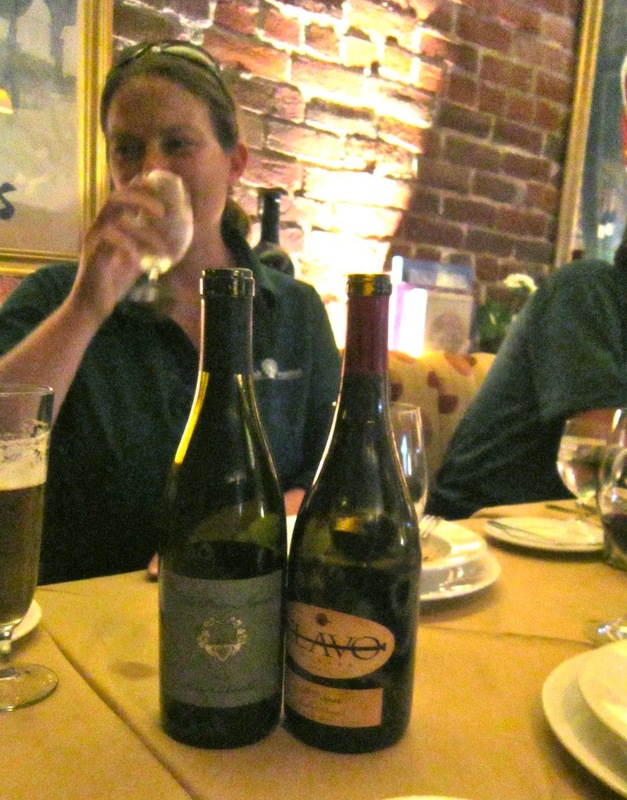 It was Friday night, during a wine weekend in Paso Robles so finding a table for 6 last minute was a challenge but nothing Melissa Good Taste could not handle. 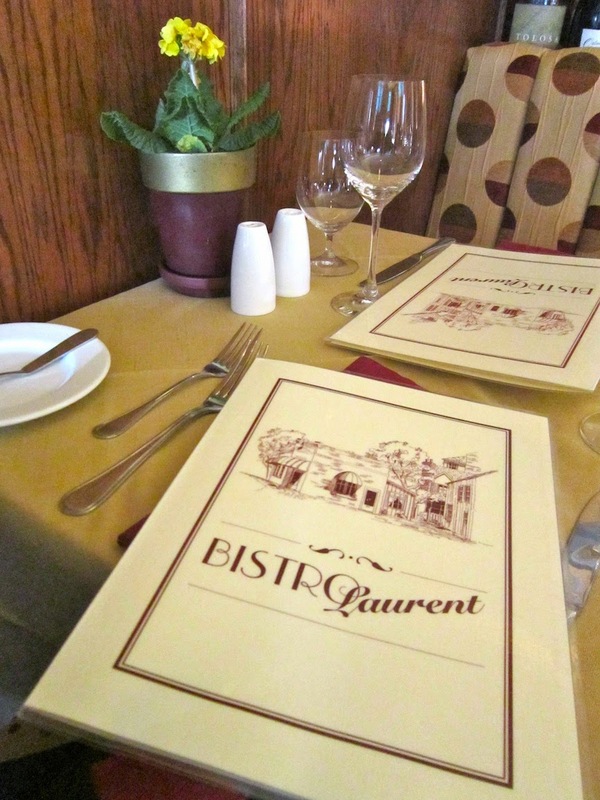 I had never been to the French restaurant, Bistro Laurent before so it was going to be an adventure! The host suggested we all participate in the Tasting Menu, we thought that was a great idea and sat back and waited in surprise as to what each course would be. A roasted onion and goat cheese toasted baguette came out first. It was a lovely start to our meal. A seared scallop salad came out next with shaved beets and spinach. It was delicately dressed and toped with fresh chives. You know I am a sucker for a tasty scallop so this course pleased me. This by far was the best dish of the evening, blowing all of the competition away. A moist, piece of halibut perfectly seared in a bed of braised lentils and bacon. I ate every single bite and licked the bowl clean. If this is on their regular menu, order it every chance you get. 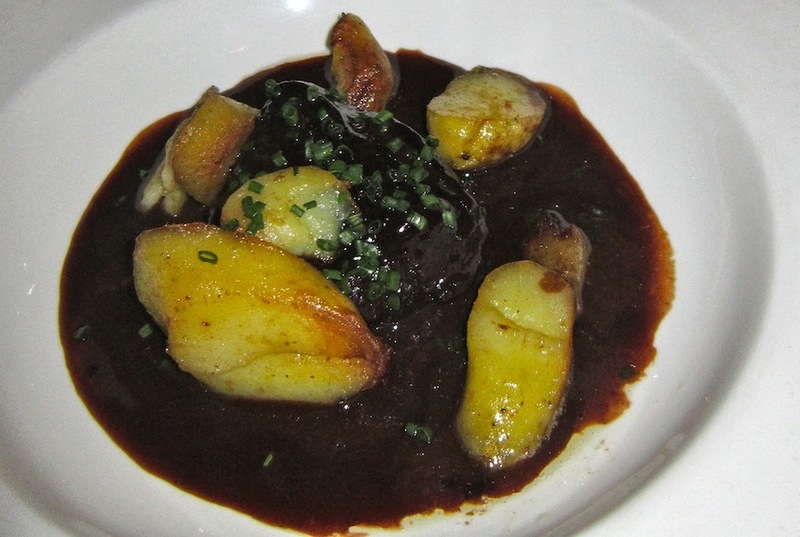 Short Ribs in a tasty gravy and roasted potatoes proved themselves decent but nothing to drool over. it was just food at this point when being compared to the fantastic halibut in the course before. Wines were served by the glass with every course, they left some on the table for me to blog about. I felt all were fantastic and well suited with each plate of food. It is an upgrade on the tasting menu but well worth it. It really felt like a complete dining experience. The cheese course was next and I was in heaven. I love interesting, funky cheeses and these were for sure those. Some of the table was turned off but I was all about it. Sipping a nice wine and sampling artisan cheese was a fantastic way to spend my evening. I am not going to lie, I was hoping for something custardy or maybe chocolate for dessert but we got something a bit more wholesome. It tasted like a soft granola bar, topped with a lemon sauce and fantastic whipped cream. It did not satisfy that sinfully delicious dessert craving that I had within. 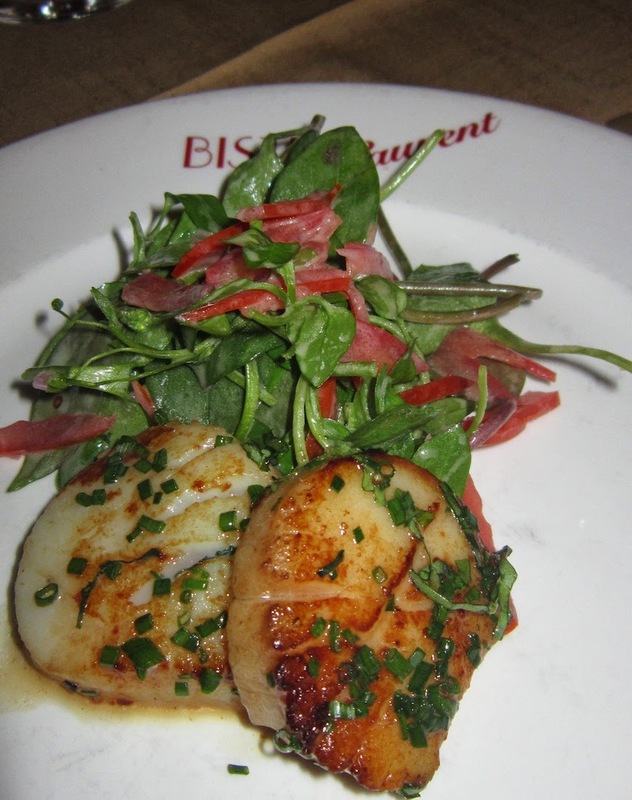 All in all, Bistro Laurent was an excellent experience. The dinner was sustenance and entertainment all in one. I love the drama of being served course after course and wander what is going to come out next. it is a little on the pricier side but if reserved for special occasions it is very much worth it. A month or so ago I was running errands in Oxnard and about lunch time I wandered into The Collection - a restaurant and shopping destination new to the area. 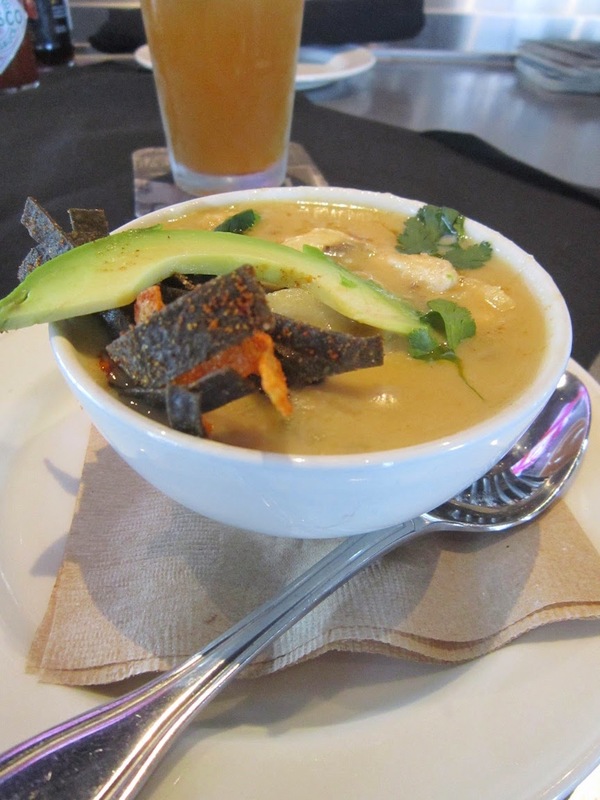 I had not tried Yard House yet and its upscale menu, yet casual atmosphere enticed me. I took a seat at the bar for meal since I was riding solo. This is where Clever Girl and I butted heads. I ordered the Chicken Tortilla soup and was very impressed. If you know Melissa Good Taste, you know she orders soup - Chicken Tortilla in particular - a lot. Was it the most authentic? Absolutely not, we are dining at an American dining institution. Was it tasty? Absolutely. Creamy white cheddar, pasilla peppers, tortilla strips, cilantro, pico de gallo and almost too large pieces of chicken made up the soup. It was creamy and slightly spicy. For a franchise soup, it was high end. 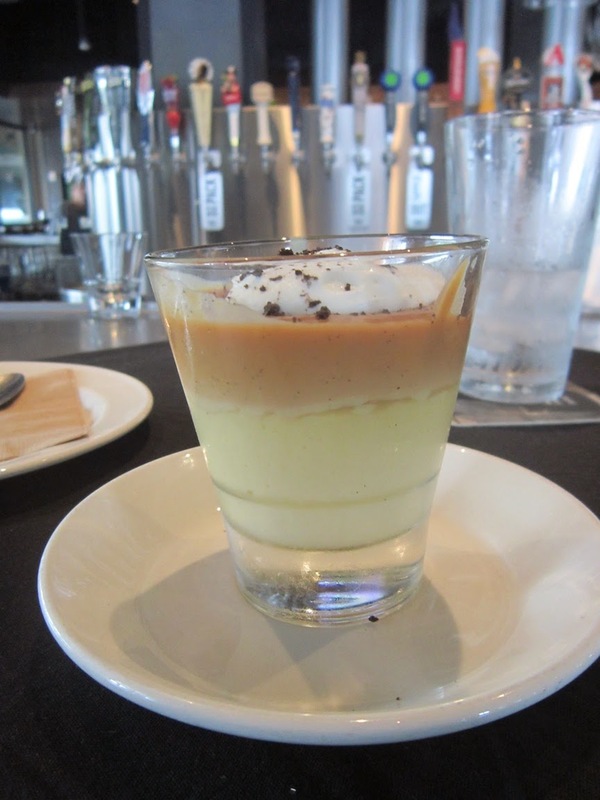 I do not normally order dessert at lunch but when I saw the Salted Butterscotch Pudding on the menu I had to give it a try. It too was a delicious dessert for being straight out of a franchise kitchen. I was impressed with the quality of the food, you do pay for it. The prices are slightly higher than what you would pay at Chili's. That is the exact example of two foodies who have different opinions about food. It makes us unique to our own blogs. I adore her writing style and courage to be so candid. Blogging is fun! Front Door Farms - Fresh Produce. Delivered. I like to do research on the internet about up and coming ways foods can be delivered to you. As you know Scott and I are always on the road so it makes going to the grocery store or farmer's markets very difficult. I came across a company called, Front Door Farms. 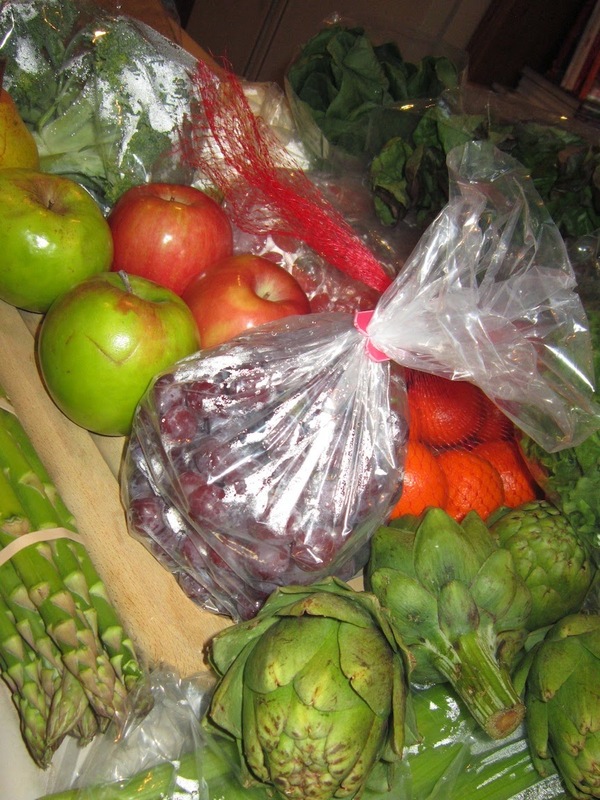 They deliver produce straight from the farms to your home. How perfect is that? As a Melissa Good Taste reader, I refer you as a friend - use coupon code 'First20' to order your first box today. I opened my box and was greeted to a box full of farm fresh fruits and vegetables. They were delicately packed and in a cool insulated box. You can reuse the ice packs, as well as the boxes. It makes for a handy traveling compartment. My box was packed full to the brim of a lot of extra goodies in the "What's For Dinner" selection. I like how as I unpacked the beautiful bounty that I got my mind racing as to what recipe I was going to experiment with. Artichoke, oranges, apples, grapes, asparagus, butter lettuce, broccoli, parsley, celery, tomatoes and pears were dancing in my mind. As the warm weather approaches I cannot wait to get my weekly box so I can fire up the BBQ and enjoy eating on my outdoor patio. From salads to grilled vegetables I cannot wait to post some of my meals produced from Front Door Farms. Check out their website www.frontdoorfarms.com and check out what box works for you and your family. If you are a person on the go, this connivence and peace of mind knowing farm fresh produce was in your refrigerator is worth its weight in gold. I am sold. Whenever Scott and I go to Paso Robles we always crave at least one night of fine Mexican food. We visited other places that did not do the trick but after my foodie research, I convinced Scott that I may have found a place. Upon sitting down we were greeted with freshly fried, salty chips. Sold. The salsa was ok, but didn't match the quality of the chips. We happily ate our chips while I looked around the restaurant. It housed a cool mural and had a homey vibe. Not the most chic decorations but I had a feeling that they could really bust out some good food. Scott read my mind and asked the waitress if they had a different salsa in the kitchen to bring out. She replied, "Spicy." And we both said, "Bring it." She was not lying, it cleared your sinuses but it had a smoky, rich taste that left your nose running and coming back for more. I ordered the pozole because it rarely on menus anymore. If you catch it on a rare weekend somewhere, you score. This pozole was outstanding because it was filled with quality portions of clean, meat. I do not like sifting through fat and skin, that is what menudo is for. I loved that it is served with tostadas with refried beans. Scott Good taste ordered the grilled fish to make his version of fish tacos. With tortillas on the side he happily assembled each one. I have to give it up to the perfectly grilled and seasoned vegetables. You do not get that in your average Mexican joint. So we have found it, our very own favorite Mexican food in Paso Robles. We love the place and happy to call it our own. We returned a total of three times throughout the course of the week and got the same great service, food and value every time. Sold.